Columns of Stryker vehicles will road march across Eastern Europe in an unprecedented exercise designed to assure America's allies. Operation Dragoon Ride is scheduled to begin March 21, and it comes one year after Russia annexed Crimea in an action condemned by Kiev and the West as an illegal land grab, but heralded by many Russians as correcting a historic injustice. It also comes as Operation Atlantic Resolve, which launched last April in the three Baltic States and Poland, prepares to expand into two new countries. "The whole purpose … is to assure those allies that live closest to the Bear that we are here," said Lt. Gen. Ben Hodges, commanding general of U.S. Army Europe. "You heard our president say very clearly, we will defend our allies, Lithuania, Latvia, Estonia, and Poland." Operation Dragoon Ride was Hodges' brainchild. The ride, which will be a first for many soldiers, represents a leader development opportunity that will test the unit's maintenance abilities, while providing a "very visible" show of assurance to local residents, Hodges said. "Rather than putting them on rail cars that move through the night, where nobody would really see it, why not do the opposite?" Hodges said during a meeting March 16 with Army Times. "The idea of moving through these towns, [the residents] will be able to literally see Stryker vehicles, talk to American soldiers." Soldiers from 3rd Squadron, 2nd Cavalry Regiment, who are currently supporting Operation Atlantic Resolve in Estonia, Latvia, Lithuania and Poland, will participate in Operation Dragoon Ride. The mission's name is a nod to the unit. A dragoon is a mounted soldier, and the "2nd Dragoons" are "the oldest mounted regiment on continuous active service in the U.S. Army," according to unit's official website. 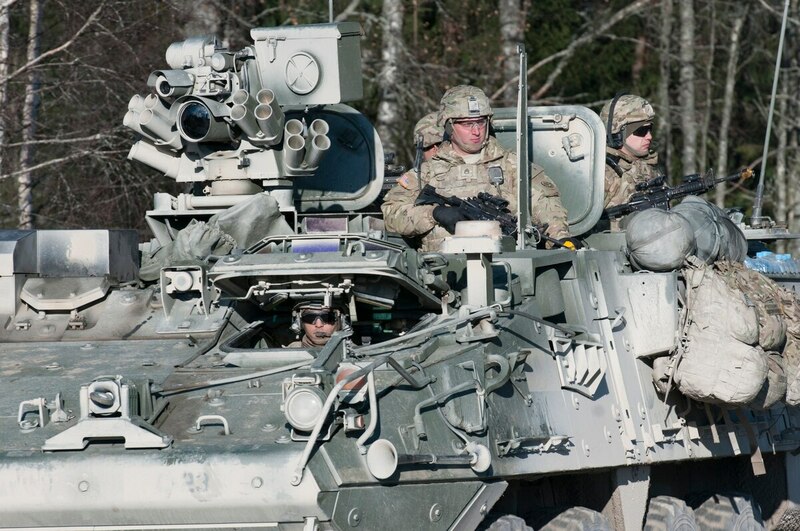 The Dragoons will road march back to their home station in Vilseck, Germany, after they are replaced in those four countries by soldiers from the 3rd Infantry Division's 2nd Battalion, 7th Infantry Regiment. For the soldiers in Estonia, the farthest away, the ride will take 13 days over nearly 1,200 miles, Hodges said. Hodges envisions the soldiers and their Strykers will travel for half a day at a time before stopping at the nearest village or town, giving them time to interact with the local population. "I envision kids crawling over those vehicles, sort of a public awareness kind of thing as well," he said. Operation Dragoon Ride also will test the Army's ability to freely move from one country to another, he said. "President Putin exercises freedom of movement all the time. He moves troops and stuff around Russia whenever he wants to," Hodges said. "For the alliance, you've got to do that by moving from country to country, and what we discovered, even though these are all NATO countries and EU countries, each one still has different diplomatic clearance requirements and that sort of thing." The convoy also showcases the Army's capability, Hodges said. "This is what the U.S. Army does," he said. "We can move a lot of capability a long distance." Staff writer Joe Gould contributed to this report.